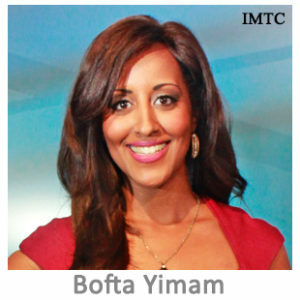 Bofta Yimam is an Emmy Award-Winning Journalist, Speaker, Media Personality, Master Storytelling and Empowerment Coach. She has been honored for her work nearly every year in her journalism career, including a Regional Emmy award and the prestigious Edward R. Murrow award. For more than a decade, she’s reported and anchored live on the morning and evening news for TV affiliates around the country, including CBS and ABC. Bofta is the first Ethiopian-American newscaster to receive an Emmy for her work. As a speaker and workshop facilitator, Bofta mixes high energy storytelling and strong content to empower audiences. Bofta works with entrepreneurs, executives and corporate professionals on crafting their compelling P.O.W.E.R. story to use in multiple channels (social media + signature talks) so they can attract their ideal client and stand out in their industry. She’s frequently tapped as a guest speaker on podcasts and currently hosts her own motivational segment, Rise and Shine With Bofta Yimam, available to listeners worldwide through Urban Media Today radio. In 2018, Bofta was recognized on the 100 Tropics Changemakers list. The awards ceremony is set to take place in Johannesburg, South Africa.